Nullbyte Ransomware can cause you a major headache if it manages to slither onto your system; yet, we cannot call this particular ransomware program a dangerous threat. The reason is that even though this infection targets most of your personal files and encrypts them in the hope of extorting money from you in return for the decryption key, there is indeed a free decryption tool available on the net that can recover your files. Therefore, we do not recommend paying these criminals the demanded ransom fee because it would be just money down the drain. However, even if such a file recovery tool exists, we do not suggest that you start looking for it and use it unless you have advanced IT knowledge. In any case, the first thing you should do to restore your computer is remove Nullbyte Ransomware immediately. If you read our full article, you will learn how you can actually avoid similar attacks and we will also reveal how to eliminate this threat source. There are two main ways for this malware infection to sneak onto your computer. First, the most frequently used method by criminals to spread ransomware is via spam e-mail campaigns. This means that you get a fake e-mail claiming to be something very important for you to see. This spam has an attachment that is indeed a disguised executable file looking like an image or document containing a fake invoice of some sort. You may believe that it is impossible for spam mails to get through your spam filter undetected, but you must revise your belief system in that case because Nullbyte Ransomware does appear somehow on your system. It is possible that such spam e-mails have a totally believable and legitimate-looking sender address to trick the filter and you, too. But the major weapon is most likely the subject of these mails. This can be anything to do with credit cards, invoices, bookings, so practically any topic that would glue your eyes to the mail and make you want to open it right away. Once you open such a mail, it is quite likely that you will also download and run the attached file that is supposed to contain the alleged wrong credit card details or the messed up hotel booking. You should know that when you actually open this downloaded file, you activate this ransomware. The problem is that by the time you manage to delete Nullbyte Ransomware from your computer, all your files will be encrypted and inaccessible. Necrobot, which is indeed a PokemonGo cheat. When you download this program from questionable sources, unfamiliar file-sharing websites, there is a good chance that you will get infected with this ransomware, too. You should stay away from such sites anyway because you may easily drop a whole bundle of threats onto your computer by clicking on any third-party content there. This means that it would be best for you to run a full-system malware scan after you remove Nullbyte Ransomware because chances are there are other threats on your computer as well. After you initiate this attack by running the downloaded file, it will target your photos, videos, documents, and other file types that could be important to you and encrypt them with an AES algorithm; most likely AES-256, which is a very often used algorithm by ransomware authors. The whole process could take less than a minute depending on the number of files affected and the performance of your PC, too. All the encrypted files get a “_nullbyte” extension, but you will surely find out about the attack from the ransom note window it displays on your screen. This window stays always on top, so even if you try to run any programs, they would open underneath it. However, this window does not cover the full screen and can be moved away, which will come in handy when you want to delete Nullbyte Ransomware. 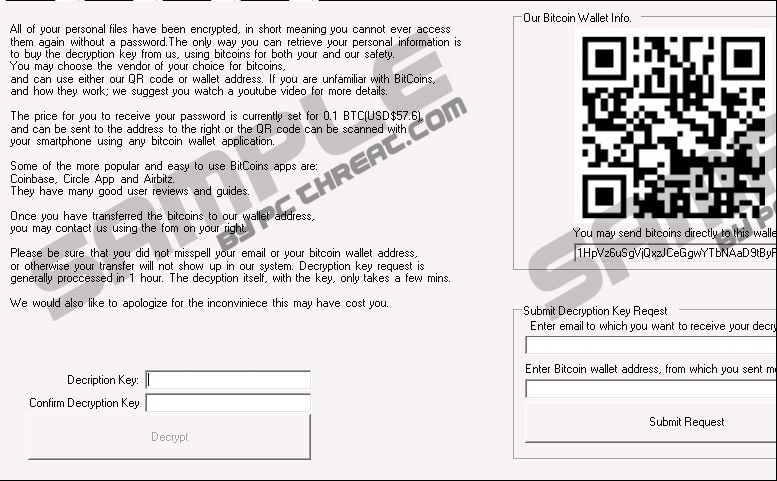 This ransom note informs you about the encryption and that the only way for you to get the essential decryption key is to pay 0.1 Bitcoin ($63) to the provided Bitcoin wallet. Although this amount does not count as a steep price compared to the 0.2 to 2 BTC that criminals generally may demand from their victims, we do not advise you to pay no matter how dire the situation seems. The truth is that this particular ransomware can be decrypted by using a tool you can find on the web. We do not suggest that you try to find and use this tool, though, if you are an inexperienced computer user; you may cause more problems than you could handle. Thus, you can ask a friend or an IT expert to help you with this. However, first of all, you should remove Nullbyte Ransomware from your system. This is also what you should do if you are lucky enough to have a recent backup of your files on a removable media. And, after this attack, hopefully, you will regularly make a copy to be on the safe side. Strangely enough, it is easier to delete this potentially dangerous threat than you would think. All you need to do is locate and bin the malicious executable file you downloaded from the spam e-mail or through the Necrobot application. We have included the necessary steps below if you need a bit of help, even though there is really not much to add; it is that simple. We hope that it is clear now how you can protect your computer from similar attacks. But even if you try to be more alert, you may still get infected in other ways. If you want proper protection for your computer against all existing malware infections, we suggest that you install a reliable anti-malware application. Quick & tested solution for Nullbyte Ransomware removal.